With calls for a general strike and civil disobedience gaining ground in the face of the economic crisis, we look at an example in Irish history when the tactic of the general strike was successfully employed by the Irish working class. During World War One, the British imperialist war effort came under severe pressure from a German offensive on the Western Front in the spring of 1918. Following a number of setbacks, the British government began to look around for a new wave of cannon fodder to be sent to the front. Accordingly, their gaze soon turned on Ireland. Viewing the Irish working class as little more than a munition of war at its disposal, the British establishment decided to force conscription on Ireland. On April 16, 1918, the Military Service Bill, which introduced conscription to the British army in Ireland was voted through the British parliament at Westminster. In an effort to avoid a backlash in Ireland, the British linked this bill to an Irish Home Rule Bill. Conscription outraged public opinion in Ireland. The bill was opposed by nationalists, republicans, socialists and the catholic clergy. On April 18, a conference was held in the Mansion House, Dublin, hosted by Lawrence O’Neill, then mayor of the capital. At the conference, the Irish Anti-Conscription Committee was formed. This committee would organise resistance to conscription on a national scale. Representatives from all shades of nationalist opinion, including organised labour, the Irish Parliamentary Party, the All for Ireland League and Sinn Fein were involved. With the backing of the catholic clergy, subscriptions to the pledge were taken at the church door in every parish on Sunday, April 21. The organised labour movement soon became the leading light in the campaign. In a show of working class strength not seen since the 1913 Lockout, a general strike was called in opposition to any attempt to introduce conscription to Ireland. At a special conference in late April, the Irish Trade Unions Congress called a one-day general strike for the 23rd of the month. Work ground to a halt in railways, docks, factories, mills, theatres, cinemas, trams, the public service, shipyards, newspapers, shops, and munitions factories. Workers withdrew their labour throughout the country and industry was brought to a halt. In his book Forgotten Revolution: The Limerick Soviet 1919, Liam Cahill noted that the strike was “complete and entire, an unprecedented event outside the continental countries”. Commenting in Liam Mellows and the Irish Revolution, the historian C Desmond Greaves said that “the British Government had succeeded in uniting against it an array of forces not seen since the days of the United Irishmen”. For the duration of the general strike, the country came to a standstill. The working class succeeded in showing who could really hold power in Ireland if there was unity and determination in action. The Irish working class put it up to the might of British imperialism and the Empire subsequently backed down. The fierce opposition shown, the success of the general strike and the USA’s entry into the imperialist war meant conscription was never introduced to Ireland. 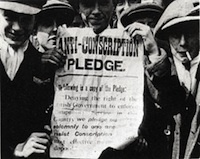 The conscription crisis helped to radicalise the Irish working class, who, less than a year later through the Irish Republican Army, would take the war to the British establishment in Ireland.